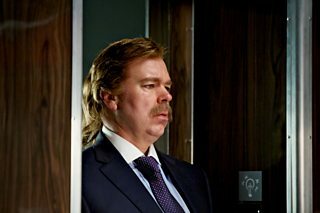 Steve Pemberton, writer and actor for shows such as A League of Gentlemen, Psychoville and Benidorm, talks to BBC Writersroom about his upcoming 2nd series of Inside No. 9. 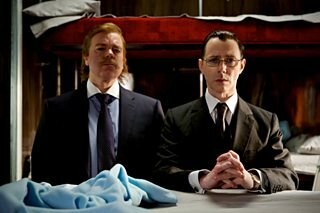 A dark comedy anthology which he co-writes/co-stars in with Reece Shearsmith. You caused a lot of discussion and acclaim for your silent episode ‘A Quiet Night In’ last series; do you have any similar convention breaking episodes in this upcoming series? Well we decided early on not to try another silent episode, in spite of countless people asking us if we were going to. We felt that "A Quiet Night In" worked well on its own terms and that it would be foolish to do an inferior version of it. We have done an episode in the new series which is set in a volunteer call centre, the Comfort Support Line. The idea was that we'd film one telephone booth on a static CCTV camera and then watch someone taking the calls. In a way it's the polar opposite of "A Quiet Night In" because it is so static and all about listening, but we stuck with the conceit and I think it really paid off. It's an experimental format, but that's what an anthology series allows you to do. Did you write these characters with particular actors in mind including yourself? And are there any parts where you cast someone else but wish you could have played? We never write with particular actors in mind, although people will often pop into our heads once we've started. In the case of La Couchette we wrote a funny character called Hugo who is a posh backpacker, but it wasn't until halfway through that Jack Whitehall popped into our heads. It did help that he was a huge fan and had expressed an interest in working with us. As we were writing it felt like I would have played Maxwell and Reece would have played Les. Then Reece said he wanted to play Maxwell and I considered being Les before finally plumping for Jorg. We will usually make sure there are at least two characters that we could play, but we won't decide which way round we'll play them until we have all 6 scripts written. There has to be a balance, so we'll do a bit of role-trading at the end, and it's often surprising to us how it ends up. But I was always keen that the show didn't turn into a "look at my wig this week!" vanity project where Reece and I always play the two central roles and no-one else gets a look in. That would become predictable. We wanted the writing and ideas to dictate our roles, not vice-versa. My favourite episode in the new series is "The 12 Days of Christine", and Reece and I have very small roles in that one - make of that what you will! With your distinctive dark comedy forming the backdrop to a number of your shows - could you ever see a cross-over of Inside No. 9 and The League of Gentlemen/Psychoville? Could Papa Lazarou or Mr Jelly ever turn up? Or are they different worlds in your mind? We did have a discussion about using David and Maureen in Inside No. 9. We were struggling with "The Understudy" script in the first series, and couldn't decide whether to write it with professional actors or amateurs. We worried that it might be a bit in-jokey using professional actors as the characters, but in the end we felt like it was a world we knew well and I'm really pleased we kept it that way. But when we were discussing making it an amateur group we thought it might be fun to use Maureen as the Lady Macbeth character, egging her son David on to commit more "bad murders" and work himself up the cast list. Ultimately though it didn't feel right to mix up the worlds like that, and Inside No. 9 had to earn its own place in the comedy universe without leaning on our past work. Having said that, some cryptic references are nice: "Psychoville" was how The League of Gentlemen was referred to when it was screened in Japan or South Korea, and in the "Tom & Gerri" episode of Inside No. 9, Gemma Arterton's character was working for a theatre director called Ollie, who we imagined was Ollie Plimsoles from Legz Akimbo, so we'll sometimes put in the odd reference like that for fans. How do you and Reece develop your ideas for the series? Does it start with the room setting? Sometimes the setting is the starting point, "La Couchette" was a case in point as I'd just done an overnight journey on holiday in France. "Cold Comfort", the call-centre one, began with the location and we allowed the story to grow from that situation. Other times we'll just think of a trigger to start writing - Reece suggested a seance or a witch-trial - and then we'll see if we can tell that story without moving from the confines of a single location. As a writing exercise it's really useful to put these limitations in place, I think it makes you sharper and more creative and economical. You and Reece make your Directing debuts in this series. Has Directing changed the way you write? Similarly does being a performer influence your writing? Certainly being a performer helps the writing. You're aware that you're going to end up playing one of these characters so they'd better all be good! As an actor reading a script you just want to get a very clear idea of what the role is that you're playing, or hoping to play, and if you don't get that then you lose interest. Sometimes it's hard to keep track of who's who if all the characters sound the same, so we hopefully know how to present the characters on the page to entice the actors to the roles, that's how we manage to get such good casts I think. It's certainly not for the money! We didn't know which episodes we would be directing as we wrote the scripts so I don't think that influenced us, but I think if we did it again I'd want to direct something without being onscreen quite so much, it's just very hard to do justice to both jobs at the same time. But the main advantage of acting in and/or directing your own scripts is that the central vision is more likely to remain intact, especially if you have a good relationship with your producers and collaborators as we have. Is it easier to write self-contained episodes and not worry about serial story arcs? I've found the writing of Inside No. 9 to be quite liberating, starting with a blank sheet every week. In a way it's daunting because you have to carve out a new setting, storyline and characters each time, but you only have to hold them in your head for 30 pages without thinking "oh it'll be great if his secret comes out in ep5" or "that's a series 2 idea". You just dive straight in with the knowledge that you have to reach a conclusion within the same half-hour, and that's refreshing. Hopefully there's no padding, and let's face it we've all seen episodes of shows, even if we love them, which have felt repetitive or inert. You send the audience all over the place with Inside No. 9, similar to the way that Jack Whitehall was flung around in the filming of the first episode of the series ‘La Couchette’, which caused him to be sick! Would you say having numerous twists is a conscious characteristic of the show? We like to keep the audience guessing and constantly surprise them, but we found that the word "twist" soon becomes reductive. It seemed like people would judge the episodes on the so-called twist, and if there wasn't one, then the episode "wasn't as good". Our aim to is to write things which you have to lean into, you have to watch actively, and if you do that your attention will be repaid. We've always enjoyed that style of writing though, it's there in The League of Gentlemen and in Psychoville. How has the Comedy landscape changed for writers during your career? I remember that doing sketches in Edinburgh in 1996 felt quite outre, the comedy scene was more stand-up dominated. Then sketch shows gained momentum with the likes of The Fast Show and Armstrong and Miller, up to The League of Gentlemen and Little Britain, and the stand-ups couldn't get a look in. Now it feels like panel shows have helped bring things back round and the sketch show seems out of favour again. Which is a huge shame because so many writers get their breaks writing these short-form pieces and it's a great way to learn what works and what your voice is. However I'm getting the feeling that there are lots of great sketch acts out there waiting to make a mark - we watched Gein's Family Gift Shop in Edinburgh and I was really keen to get them involved in the new series - and the likes of Max and Ivan, Toby and WitTank all seem to be making their mark. What advice would you give to someone starting out as a Comedy writer now? I guess work hard and keep writing. It's more frustrating for the struggling actor because you can't act in isolation, you need a project, someone needs to choose you to do something. A writer can always write! My main advice, which I need to heed myself every day, is that the first draft doesn't need to be perfect, you can learn what the first scene needs to be by the time you've written the last scene. I'm guilty of opening up the laptop and always fiddling with the first 5 pages instead of ploughing on to the end. Are you currently working on anything else? Including any potential future episode thoughts for Inside No. 9?